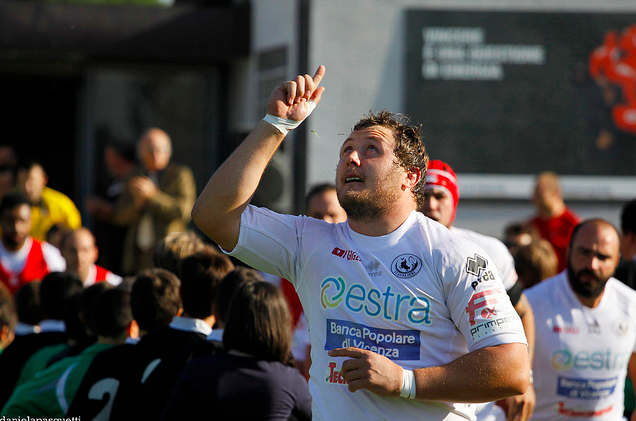 Ex-Munster, Toulon and Newcastle prop Tim Ryan is now playing for Italian Super 10 side Cavalieri. (c) Daniela Pasquetti. In the last Exiled Irish piece, I looked at several Ulster-bred players who are contracted in the Aviva Premiership. This time around, Italy is the location. There are three Irish professionals playing in the Italian Super 10 at the moment. It’s definitely a league that is well under the radar here in Ireland, and in the rest of Europe. Still, it’s a fantastic place to be playing rugby. The quality of the league is obviously at a lower level than our own PRO12, but that simply means further opportunities for Irish guys to make a career for themselves. With it’s warm climate and incredible cuisine, Italy could certainly be a sweet consolation for players who haven’t quite been able to break through for the provinces, or looking for a new challenge later in their careers. Alongside an intelligent agent, the Italian Super 10 could also be used as a springboard to higher success. It’s definitely worth a thought, especially here in Ireland where our view of rugby can be very insular. Ryan takes to the field for Cavalieri. 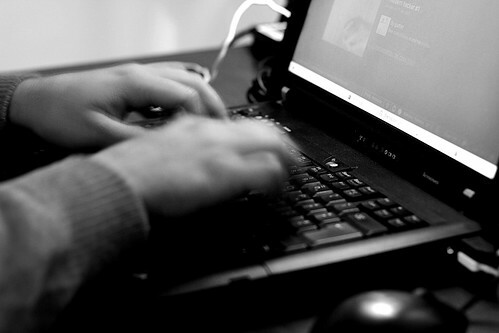 (c) Daniela Pasquetti. Tighthead prop Ryan was an Irish international at U18 and U19 level, although he played in the back-row at that stage. The chronic lack of tightheads in Ireland dictated that the Cork man was soon converted to the front-row. His strength and power made him an early success, with Munster signing him at the start of the ’05/06 season. However, opportunities were limited and over the next four seasons the Ryan made just 13 appearances off the bench. 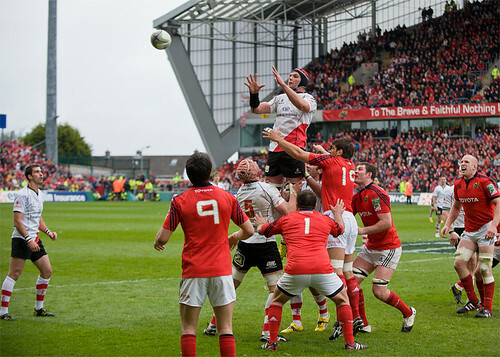 His only start came against the All Blacks as Munster almost pulled off a famous win in November 2008. 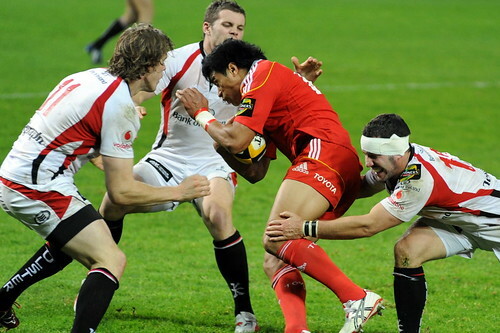 Ryan’s performance that day convinced Top 14 side Toulon to give him a chance for the ’09/10 season. The 120kg prop made 12 appearances over the course of the year before joining Premiership outfit Newcastle for the ’10/11 campaign. In England, Ryan made just 9 starts and he moved on at the start of this season to current club Cavalieri, based in Prato. The 27-year-old appears to have found his feet extremely well in Italy. 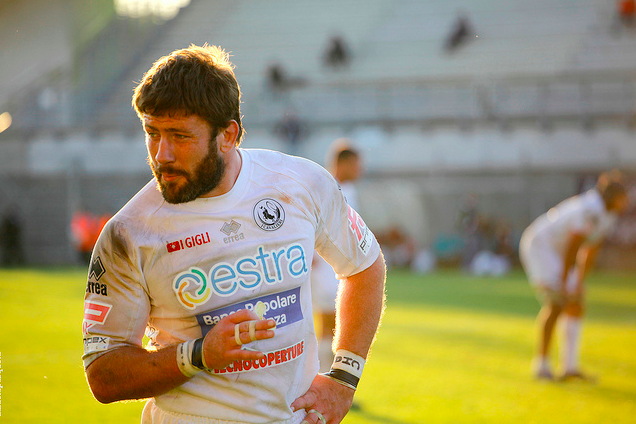 He’s been first-choice at tighthead, playing 6 Amlin Cup games. Cavalieri head into their Super 10 play-off semi-final this Friday as favourites after topping the regular season table. Ryan has become a vital cog for the Italian side with his powerful ball-carrying and strength in the scrum. Dave (right) after being beaten by Tim's (left) Cavalieri side last month. (c) Daniela Pasquetti. Dave is Tim’s younger brother and he’s also based in Italy, with Super 10 side Lazio. The younger Ryan plays mainly at loosehead prop. An Irish U19 international, Dave came through the Munster Academy to secure a full-time professional contract. However, similarly to his brother’s experience, the opportunities were limited to just 2 starts and 8 substitute appearances over the course of three seasons. With his time at Munster up, Dave moved to Lazio at the beginning of this season. 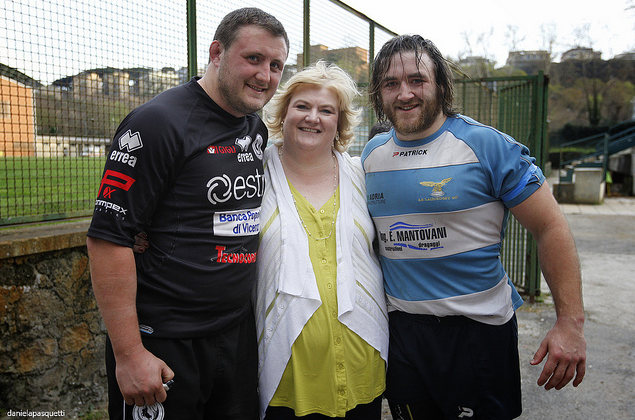 He’s now enjoying regular professional rugby for the first time, starting all but 2 of Lazio’s Super 10 games this season. Lazio finished their season 6th in the league after a very inconsistent campaign which saw just 6 wins in 18 games. Still, it’s only the Rome-based club’s second season in the Super 10 after winning promotion from the Serie A in ’09/10. They will continue to improve and so will 25-year-old Ryan. Italy has a strong reputation for scrummaging excellence, and that’s one of the areas where Ryan is going about proving himself. If he can build on this season’s efforts, he may well earn a move to a more prestigious level. He has plenty of time on his hands and plenty of talent. Hickey (10) after helping Petrarca to a win over Tim Ryan's Cavalieri. (c) Daniela Pasquetti. Dublin-born Hickey is an ex-Ireland Schools, U21 and ‘A’ international, currently contracted to Super 10 side Petrarca Padova. He earned his first professional contract with Leinster back in ’05/06. Only three substitute appearances followed, so Hickey moved south to join Munster in ’06/07. Again, opportunities were limited (10 in total) so the outhalf/fullback took up an offer from Premiership side London Irish. Hickey had two enjoyable seasons with Irish, making 15 Premiership starts, as well as featuring in the Heineken Cup and Amlin Cup. 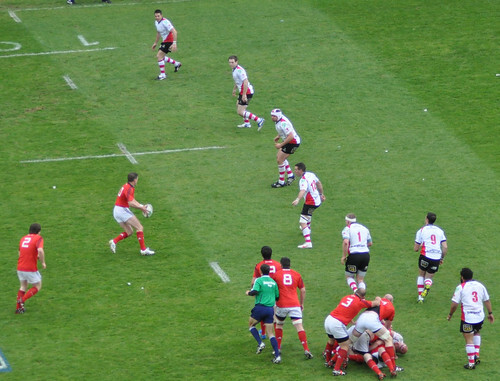 The ’09/10 season saw a move to Wasps, but again first-team rugby was hard to come by. Hickey made just 6 appearances before leaving the club at the end of the campaign. 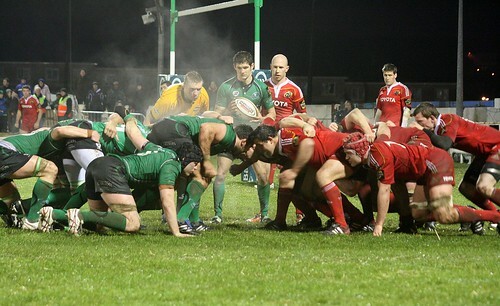 The outhalf returned to Ireland and played a season of Ulster Bank League rugby with Lansdowne. However, the stint at home didn’t last long and Hickey was off to Petrarca last summer. The 30-year-old has been integral for the Italians since, starting every game this season and kicking 182 points (3rd best in the league) as well as chipping in with a try. However, last year’s champions narrowly missed out on a play-off spot due to points difference. Still, with Aironi folding, and the possibility of a new Italian PRO12 side, this is a good time for Hickey to be impressing. Young in action for Cavalieri earlier this season. (c) Daniela Pasquetti. The loosehead was a teammate of Tim Ryan’s at Cavaliero in the Super 10 this season. Young’s career began with Ulster in April 2002 when he came off the bench against Connacht in an Interprovincial clash. It took until ’05/06 to establish himself as undoubted first-choice at the province. His excellent form that season resulted in an international call-up and Young went on to earn 8 caps for Ireland. He was also a member of the 2007 Rugby World Cup squad. 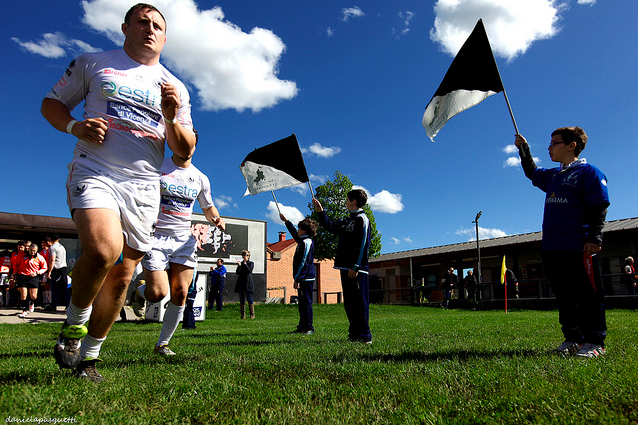 In 2009, he won a Churchill Cup with Ireland ‘A’ and also passed to 100 cap mark for Ulster. Last season at Ulster, Young was still an important part of the squad, making 19 appearances. His technical scrummaging ability and the fact that he could cover at tighthead made him valuable enough to earn 132 caps in total. However, this season saw the Ballymena man take on a new challenge with Cavalieri. Unfortunately, injury restricted the 30-year-old to just 4 starts before Christmas. A front-row including himself and Ryan would have been a great sight. According to the Cavalieri website, Young’s serious back problem resulted in termination of his contract. A well-placed insider has reported that Young’s injury may mean his career is at an end. Despite the injury, hopefully he was able to enjoy the taste of a new culture. Frank Murphy spins a pass away during Connacht's 26-21 win over Ulster last weekend. (c) Eoin Gardiner. This week’s IRUPA Player and Young Player of the Season shortlists unsurprisingly failed to include a Connacht player. Ronan Loughney was included on the Medal for Excellence shortlist alongside Shane Jennings and Mick O’Driscoll. That award is basically the ‘Unsung Hero’ prize. Check out the full shortlists for all the awards here. Surely the lists in the main competitions could have been extended to four to include a player from Connacht, seeing as every other province is represented? Mike McCarthy, Brett Wilkinson, Gavin Duffy and Loughney have been ever-present and instrumental in all of the big Connacht performances this season. In the Young Player category, Tiernan O’Halloran’s superb season deserves mention. Anyway, Eric Elwood and his squad will be unconcerned ahead of a weekend where they can earn a 3rd consecutive win in the PRO12 . They host Aironi in the Sportsground tomorrow evening (17.00 KO). If they win, it will be their second best run of form since this competition took on the current league format back in 2003/04. That season, Connacht won 4 games on the trot (Borders, Glasgow, Llanelli and Borders again, for the record). Since then, the best they have managed in the league is two wins in a row. It’s been a rough ride for Connacht rugby since the Celtic/Magners/PRO12 league’s inception. They have finished in the bottom two positions for seven consecutive seasons. That 4-game run in ’03/04 helped them to 9th of 12 teams, their best-ever final standing since the competition became one league. In the two seasons prior to ’03/04, the tournament was split into two pools of 8, with the top 4 teams in each pool entering the quarter-finals. 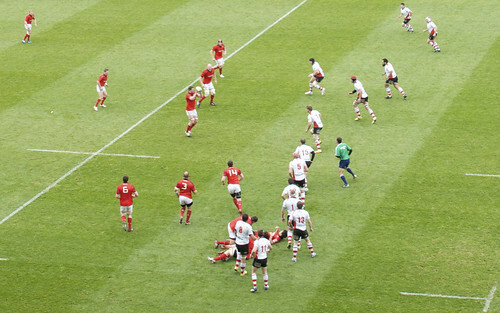 Connacht rugby has always been overshadowed by its provincial rivals. (c) Eoin Gardiner. Both those seasons were particularly successful for Connacht as they reached the quarter-finals in consecutive campaigns, losing to Glasgow in ’01/02 and Munster in ’02/03. In that ’02/03 season, Connacht even had a 5-game winning run (Borders, Cardiff, Leinster, Newport and Bridgend that time). Those seem like relative glory days compared with what the western province’s fans have been watching since. However, as I have mentioned before and truly believe, the signs from Connacht this season have been positive. Tomorrow’s game at home to Aironi is one that Elwood’s men simply have to be winning if they are to continue moving forward. They are a better team than Aironi and their performance needs to show the confidence that has been building in the second half of this season, highlighted by wins over Harlequins and Ulster. If Connacht can manage to win both of their remaining fixtures (the final one is away to the Warriors) then they have a strong chance of a best-ever 8th-placed finish. If that is achieved, coupled with a first Heineken Cup win in their debut season, this campaign will have represented superb progress for the province. Elwood has managed to blood some exciting young talent this season in the likes of Eoin Griffin, Dave McSharry, O’Halloran and Denis Buckley. Ireland U20s’ fullback Shane Layden will hope to join those ranks next season. The signings of Nathan White, Dan Parks and Willie Faloon will certainly add quality to Elwood’s squad too. The Connacht defence smothers Ruan Pienaar during the win over Ulster. (c) Eoin Gardiner. The hope for Irish rugby is that either Ulster or Leinster wins the Heineken Cup, thereby ensuring qualification for Connacht again. Elwood would be better prepared to balance his squad at the second time of asking. This season, Connacht were often stretched, playing largely the same team from week to week. That effected their PRO12 form, manifested in the inability to see out games from winning positions. Another positive is that Connacht will field an ‘A’ team in the British and Irish Cup for the first time next season. That means decent exposure for more of the province’s Academy and underage players. Furthermore, Connacht are exempt from the IRFU’s succession strategy, which will soon limit the number of Non-Irish Qualified players at the other three provinces. Elwood and his management team will have few restrictions as they aim to bring Connacht rugby to a new level in the coming years. But let’s not get ahead of ourselves. Small steps at a time, inch by inch; that’s the way. It all starts with securing a 3rd consecutive PRO12 win tomorrow in Galway. That would represent clear, statistical progress. Do that and focus will turn to the Warriors, where a win could mean a best-ever finish. It’s impossible to say for certain where Connacht will go from there, but I’m optimistic.